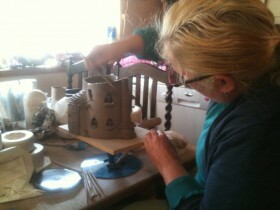 Since I started making fairy doors two years ago, I have constantly been asked “Do you do houses as well?”. 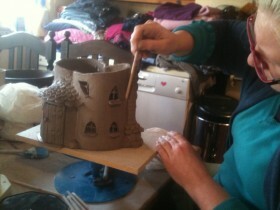 So last month, while the girls and I were playing with clay, I started building. Four hours later I was still building, – the girls had got bored and were off playing something else – but I just kept going. 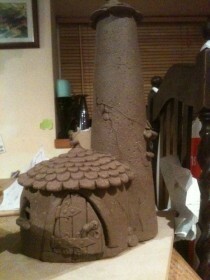 Three days later I had four fairy houses and quite a substantial fairy pub. 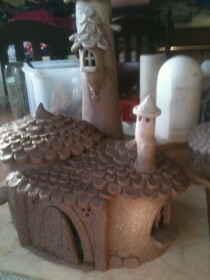 It seems fairy’s favor houses with turrets and little windows. 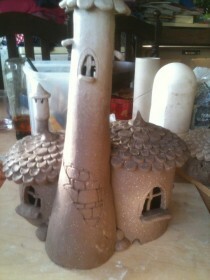 …and a bit more here… and it needs another window here… and a chimney and some more tiles. Before I knew it I had a small fairy village! And three days had disappeared!!! 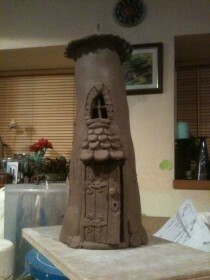 I’ve used my fairy door press molds to get a lot of detail in a small area. Then I cut around the door so it can be opened a little. This should look good with a light inside. The single tower only took two and a half hours to make. But the big two story pub (at the top) I finally finished almost nine hours after I started it. 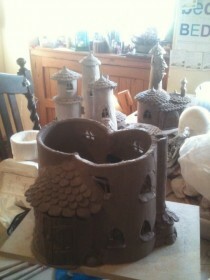 The fairy houses are now loaded into the kiln ready to be fired. 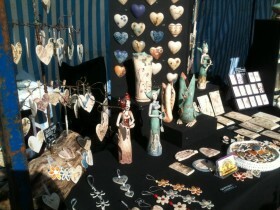 My Christmas decorations are now ready to buy on Etsy shop, get ready for the festive season with my decorations. Every Christmas decoration is handmade and unique. They are made from white Porcelain and have a translucent quality. They look beautiful with Christmas lights behind them as they appear to glow with the light. These Christmas decorations are made to be hung on the Christmas tree or anywhere else you can think. There are five different types sold in sets of three. If you want to buy more than three then contact me.